The relief provided to patients through direct pain management is an important service. A very common pain treatment to alleviate peripheral nerve pain is a Trigger Point Injection. This is a simple treatment delivered in the our office here at Orland Park Integrated Health and can provide both short and long-term pain relief. The trigger point is a tender spot, often defined by a knot in the muscle. Pressure on this nodule causes pain to radiate around the area. These points are associated with fibromyalgia, neck, and back pain, including lower and upper back, as well as headaches and temporomandibular pain. The Trigger Point Injection is administered directly into the trigger point for the purpose of pain management. At times, the injection is nothing more than a needle with no medication being introduced (“dry needling”). The typical medicines injected include anesthetics or corticosteroids, or combinations of both. Whatever the specifics of the injection, it renders the trigger point inactive and pain dissipates and is relieved. Both pain management specialists and family doctors can give these injections. As mentioned, trigger point injection therapy is a simple procedure. The physician locates the trigger point through manual palpation. The site is cleaned, the needle is inserted, medication is delivered, and the injection site is finally protected by an ordinary Band-aid. Sometimes the skin will be desensitized with a numbing spray prior to giving the injection. Pain following the procedure is minimal or non-existent and can be addressed with acetaminophen or ibuprofen. 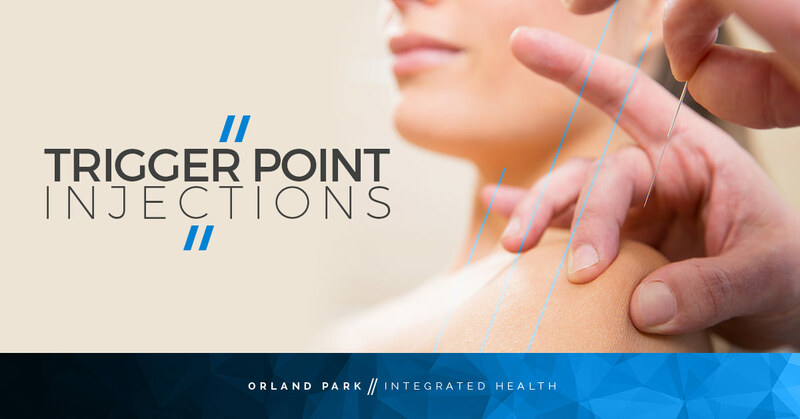 If this is an integrated health treatment for pain management that you are interested in trying, contact one of our doctors at Orland Park today.